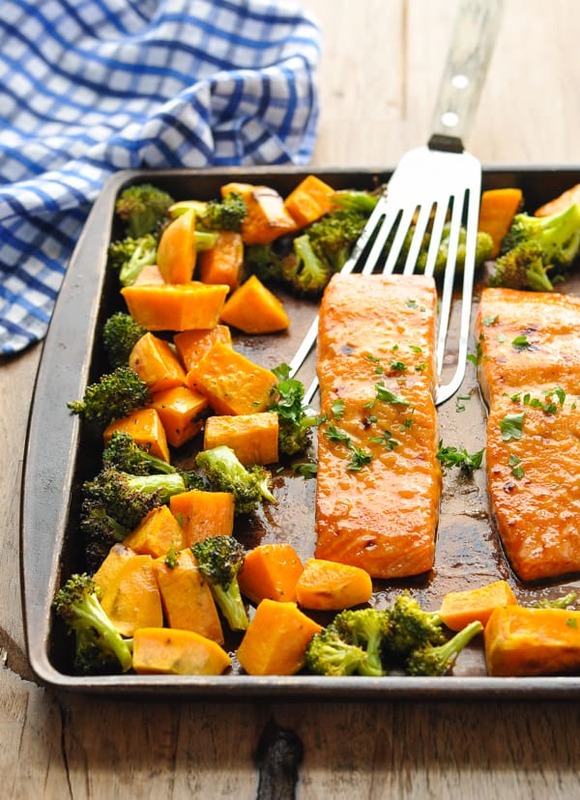 With just 5 ingredients, this Sheet Pan Dinner with Maple Glazed Salmon, Sweet Potatoes and Broccoli is an easy way to serve a healthy meal! With just 5 ingredients, this Sheet Pan Dinner is an easy way to get to get a healthy meal on the table FAST! 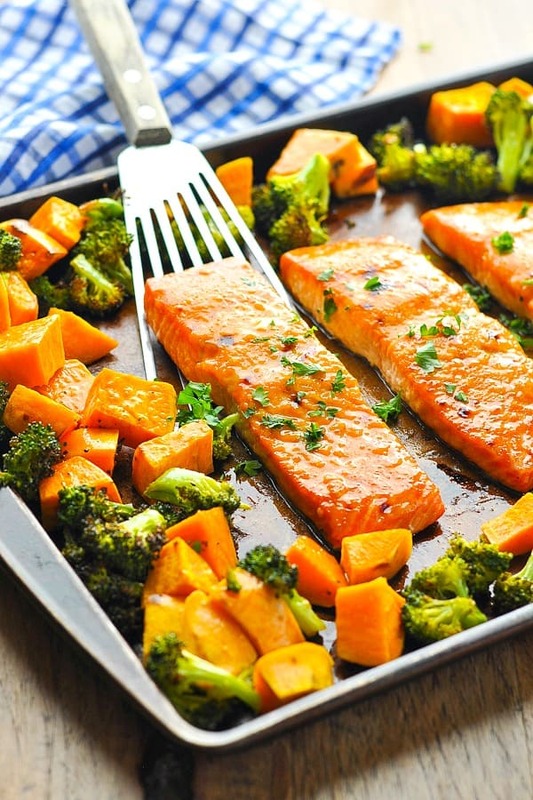 By baking the Maple-Glazed Salmon with Sweet Potatoes and Broccoli all on one tray, there are very few dishes to wash at the end of this family-friendly meal! If you couldn’t tell, I love the idea of one-dish meals! Whether it’s made in a slow cooker, in a soup pot, or in a casserole dish, quick meals with very few dishes to wash get my stamp of approval! A “Sheet Pan Dinner” is simply a meal that cooks on one tray (or baking sheet). You don’t have to juggle meat on the stove, sides in the oven, and salad in a bowl! Instead, throw everything onto a single dish and you’ve got your protein, starch and veggies ready to go. I had to play around with the timing on this particular sheet pan supper to get it just right in my oven, but I was finally VERY satisfied with the results…and I’m excited to share them with you today. The meal is packed with nutrition, it tastes delicious, and best of all…you have a complete dinner cooked on a single tray! If you’re wondering, “What should I make for dinner?” then this healthy Sheet Pan Dinner is the perfect solution! After brushing the salmon with a simple maple-dijon glaze, the end result is a crispy caramelized outside and a tender, moist inside. The key is giving the potatoes and broccoli a head-start in the oven before adding the fish to the pan. That way your veggies have time to cook until they’re tender, without drying out the salmon. 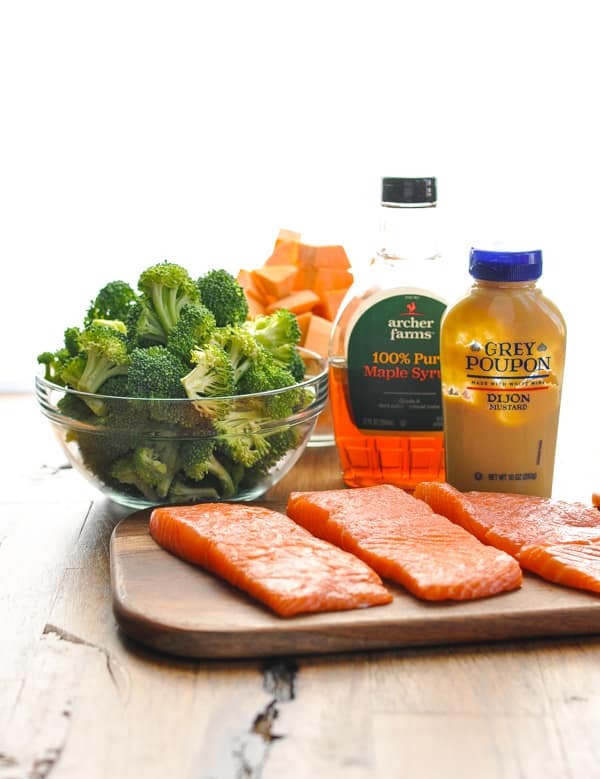 Let’s start with the 5 ingredients: you’ll need sweet potatoes, broccoli, salmon, maple syrup and Dijon mustard. Plus some olive oil, salt and pepper! 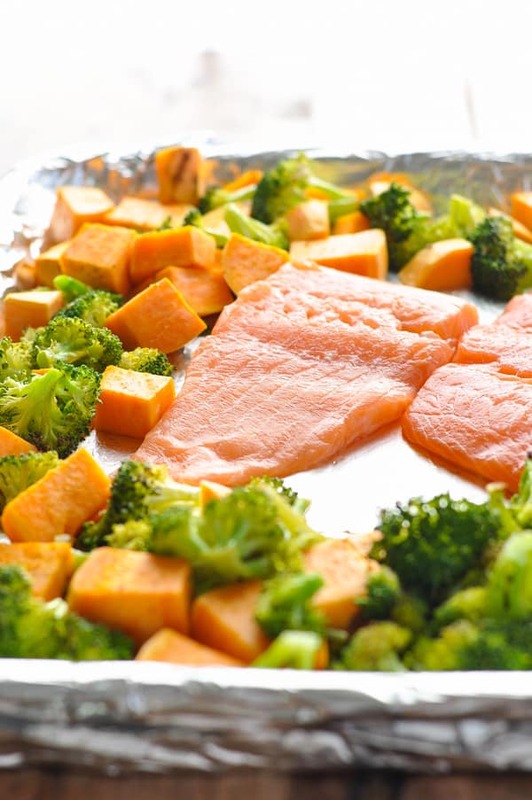 Line a half sheet pan with foil (for easy clean up), and spread the broccoli and sweet potatoes in a single layer on the pan. Drizzle with olive oil, toss to coat everything evenly with the oil, and season with salt and pepper, to taste. Roast the vegetables in the oven at 425 degrees F for about 15 minutes, or until the potatoes are just about fork-tender. 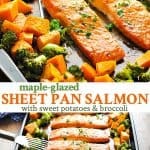 While the veggies are in the oven, prepare the maple glaze for the salmon. It’s SO good and tastes like liquid GOLD. 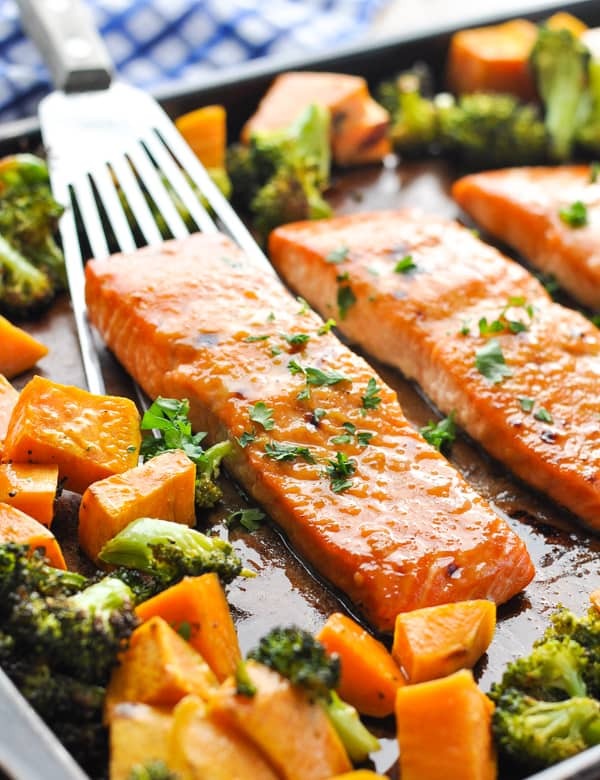 Once the potatoes are almost tender, remove the pan from the oven, push the vegetables to the edge of the pan, and place the salmon in the center. Leave some space in between each piece of salmon to allow even cooking. Turn the oven to broil on “HIGH” setting. Brush each piece of fish with plenty of maple glaze, and place the sheet pan dinner under the broiler. Broil for 7-10 minutes, or until fish is crispy on the outside and flakes easily with a fork. Broiling gives the salmon a beautifully crisp exterior, while keeping the inside moist and tender. It also produces a great char on the outside of the broccoli and potatoes, which gives them so much extra flavor! Don’t forget to line your sheet pan with foil. This makes clean up a breeze! Chop the potatoes into small, bite-size pieces. You want the potatoes to be tender by the end of the cooking time, so it’s important to keep the pieces small. Larger chunks require more time in the oven. Leave some space in between each piece of salmon to allow even cooking. Don’t want to use sweet potatoes? Substitute with 24 ounces of halved (or quartered) petite red potatoes. Instead of broccoli, try using frozen cut green beans. Add the green beans to the sheet pan at the same time that you add the salmon. They don’t require very long to cook. 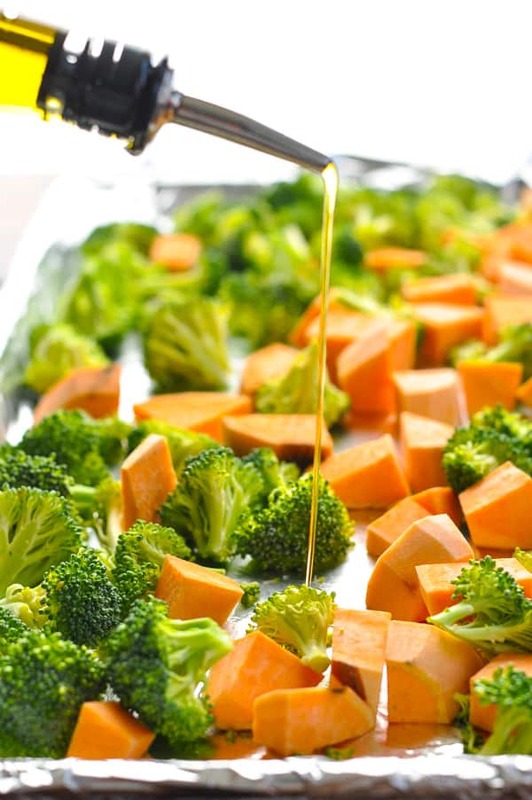 Spread sweet potatoes and broccoli onto prepared pan and drizzle with 2 tablespoons of olive oil, or more as needed to fully coat the vegetables. Toss the vegetables in the oil and season with salt and pepper, to taste. Roast for 10-15 minutes, or until potatoes are just about fork-tender. While potatoes and broccoli are roasting, prepare glaze for salmon. 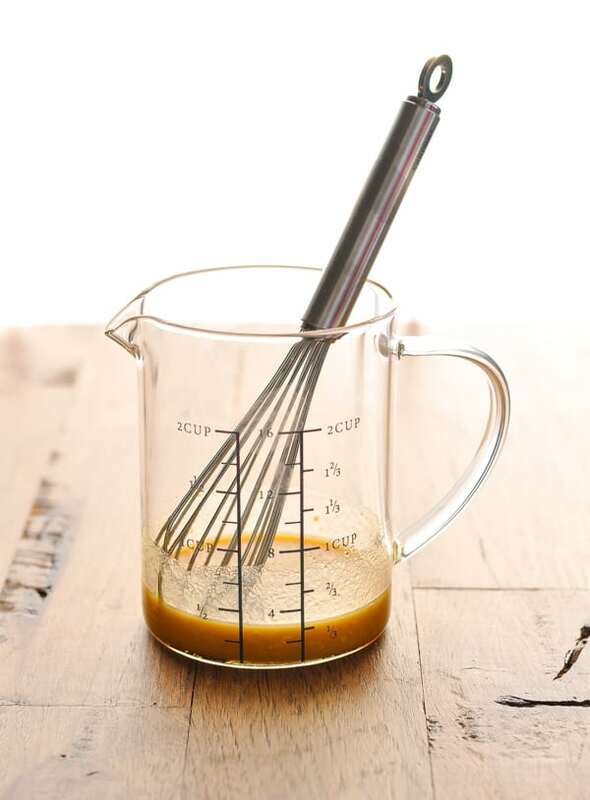 In a small bowl, whisk together maple syrup, mustard, ¼ teaspoon salt, and ¼ teaspoon pepper. Place salmon in center of tray, leaving at least ½-inch of space in between each fillet so that they cook evenly. 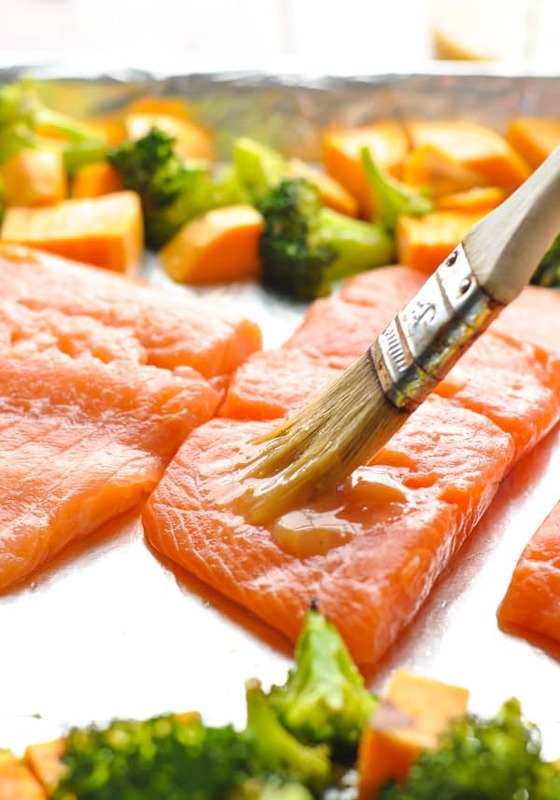 Brush glaze on top of each piece of salmon. Broil for 7-10 minutes, or until salmon flakes easily with a fork and top is browned and crispy. Potatoes and broccoli should be roasted and tender as well. The total broiling time will depend on the size and thickness of your fish. Don't forget to line your sheet pan with foil. This makes clean up a breeze! Chop the potatoes into small, bite-size pieces. You want the potatoes to be tender by the end of the cooking time, so it's important to keep the pieces small. Larger chunks require more time in the oven. Don't want to use sweet potatoes? Substitute with 24 ounces of halved (or quartered) petite red potatoes. Instead of broccoli, try using frozen cut green beans. Add the green beans to the sheet pan at the same time that you add the salmon. They don't require very long to cook. This recipe was originally published in September, 2015. It was updated in January, 2019. I love the idea of a sheet pan meal, Blair!What a great way to make dinner on busy weeknights. Salmon is one of my favorites, so I cant wait to try this out. Pinned! Thanks so much, Gayle! It’s definitely perfect for busy evenings. So fast, so easy, and no clean-up! I love any meal that requires one simple pan! 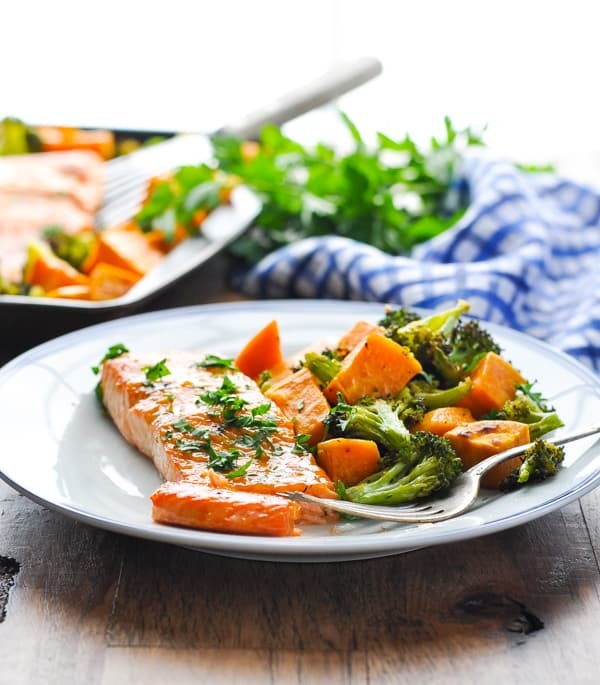 Maple glazed salmon sounds delicious with sweet potatoes and broccoli! Yum! I love salmon, but we’ve eaten so much of it lately. Any recommendations for another fish that could substituted in this recipe? Fixed this for dinner last night and it was great. Did have to adjust cooking times and found when I put salmon on broil after a couple of minutes the vegetables started burning and salmon was not getting done. Took vegetables off pan and finished the salmon. I will definitely try this again. But with adjustments in cooking. Joan, after I read your comment about the salmon not cooking fast enough, I made sure my salmon was thin enough to cook fast. I had thicker pieces of salmon which I cut in half. Hope that helps! What would be the measurements/ingredients if i were to make this for just one person? Added some onion powder, garlic powder, paprika, smoked paprika to the potatoes and veggies. The “char” you mentioned by broiling was spot on. We live at altitude so we added a minute to each section of the directions. One of the best meals we’ve had in awhile, no joke. I’ve made this a couple times now…love the ease of it all…and the roasted veggies and potatoes. I also love swordfish…do you think this same recipe would work as well for that? That’s great, Luann! I’m so glad that you like it! 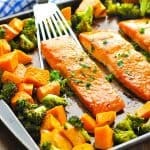 I was looking for a recipe that included yams and broccoli to go with my salmon and luckily found yours! I had already seasoned my salmon with a mixture of Grill Mates Seafood seasoning, smoked paprika, garlic powder, old Bay seasoning among other spices with EVOO and lemon juice prior to finding this recipe. I also seasoned the yams and broccoli with salt, pepper, smoked paprika and EVOO. The pan idea Is so simple and delicious! And cleanup was a breeze. Sounds perfect, Carolina! So glad that you enjoyed it! Thank you! Excited to try this out!